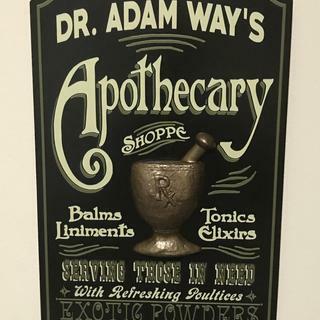 This hand-painted, artfully-crafted wooden bar sign features an old-fashioned apothecary design and free personalization. Add some old timey charm to your home bar with this personalized wooden bar sign. Proudly handcrafted to order in the USA by skilled artisans, this special bar sign is made from shaped wood planks, hand painted, and professionally printed using proprietary Poly-Arch Lithography. It features a design that brings to mind old-fashioned apothecary shops, all necessary mounting hardware, and included free personalization so all your guests know just how good your taste is. Your home bar deserves the best bar signs. So order your unique piece of personalized, wall-hanging art now! This is awesome. Totally worth it. This sign was a wonderful addition to our home bar area. BEST ANSWER: Hi Adam, you would need to include the apostrophe and s at the end if that's how you want it to be written. It is printed exactly as you enter the information.